First off, to make things abundantly clear, these predictions only hold water if and when the Yankees make it to the ALDS. Why? Because predicting the roster for a one game playoff is madness—when you need only one starter and theoretically only a handful of relievers, the possibilities for a 25-man unit are endless. On Tuesday against Houston, it’s entirely possible (or even likely) the Yanks could field a roster with 7 or fewer pitchers, but a bevy of pinch runners, hitters, and late-inning defensive subs. With southpaw ace Dallas Keuchel on the hill for the Astros, you can take it to the bank you will see Rob Refsnyder not only on the roster, but in the starting lineup too. More on the wildcard later, for now, on to the hypothetical ALDS roster. Masahiro Tanaka: The de facto ace of what’s been an underwhelming staff. He’ll start Tuesday against Houston, and then, if the Yanks progress, Game 3 of the ALDS against the Royals. Luis Severino: He’s just 11 games into his major league career, but right now, he’s the probable starter for game 1 of the ALDS. And why not? 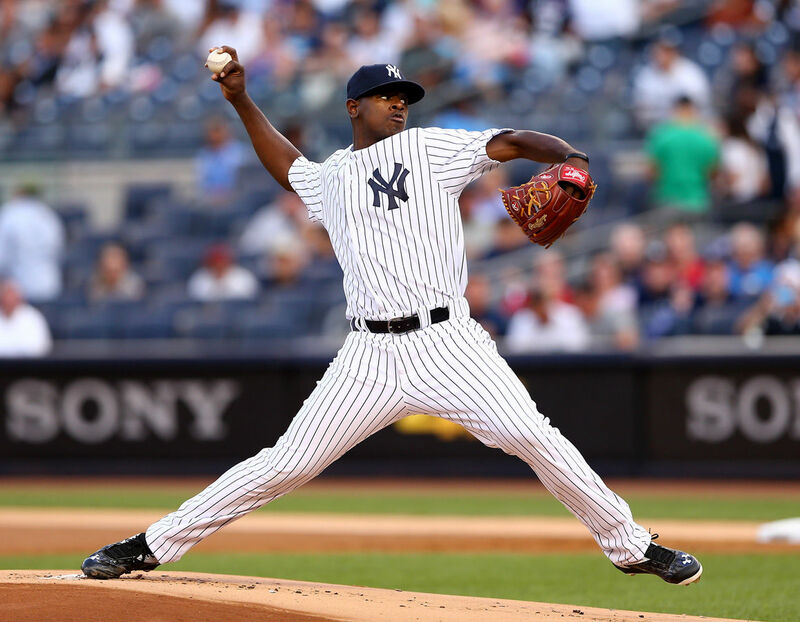 Since debuting in August, Severino has been the Yankees best starter, posting a 2.89 ERA. He was even allowed to go 7 innings for the first time in his fledgling career his last start against Toronto. CC Sabathia: Like a phoenix rising from the ashes….well, not quite. But CC has been significantly better since August, following a putrid first 4 months of the season. Given his big game experience and the lack of better options, he’ll get the ball in game 2, and, since he hasn’t pitched since the 1st, is even a dark horse candidate to start game 1. Michael Pineda: Pineda has been a piñata of late—4 earned and 7 earned his last two starts—but given that the only realistic alternative in this spot is Ivan Nova, he’ll be the Yanks 4th starter. Occasionally brilliant, but usually frustrating, he’s turned into latter-day AJ Burnett since coming off the DL in August. Ivan Nova: Strictly in case of emergency. Yes, he’s coming off of Tommy John surgery, but he’s gotten progressively worse instead of better as the season wore on. Adam Warren: The demise of everyone in the Yankees ‘pen not named Miller, Betances, or Wilson means the Bombers Mr. Everything is once again a reliever—and they’ll likely deploy him in a multitude of roles, not just long relief. Just call him Ramiro Mendoza. Andrew Miller: Only two blown saves and a sparkling 14 k’s per 9 and 0.86 WHIP. He’s been everything anyone could’ve hoped and more. Dellin Betances: The numbers are outstanding, but the oft-used righty began to show signs of fatigue in September and October. He’ll need to regain his lights-out form if the Yanks are to advance. Justin Wilson: Power arm, power stuff, and, with the demise of Chasen Shreve, the new 7th inning guy. Brandon Pinder: Another power arm with decent numbers. Won’t be used in anything except mop up duty. Jame Pazos: Who? He’s faced just 15 batters in his career, but he’s retired 11 of them. A lefty who throws hard, Chasen Shreve’s confounding inability to get anyone out the last month costs him the spot on the playoff roster it once seemed so sure he’d have. Note: The Yankees hope Nathan Eovaldi will be back in time of the ALDS, but given that there’s no possibility of making a rehab start, the best case scenario would see him placed in the bullpen, which would likely cost Pinder a spot. Brett Gardner: Brett the Jet’s annual late season swoon saw him finish under .260 for the second straight year. With the lineup in the midst of a power outage, the Yanks will need pre all-star (.302) not post all-star (.210) Gardner to show up in October. Jacoby Ellsbury: Beginning to look like an albatross of a contract. A strong postseason would help quell that tide. Carlos Beltran: Quietly, Carlos Beltran was the Yankee’s offensive MVP the second half of the season, and since a disastrous April, is hitting .290 with 19 homers. With a postseason track record that is second to none, Beltran, along with Alex Rodriguez, will be called upon to anchor the Yankees lineup. Chris Young: He’ll garner some at bats against lefties and come in late in games as a defensive sub. His power has long since dried up—just 4 homers since the all-star break, but Young salvaged his season by hitting .300 in September/October. Rico Noel: Speed kills. Noel will get as many postseason AB’s as I will—0—but he’s not here to hit. On a team that’s struggled to score lately, the ability to manufacture runs late in games is critical, hence Noels inclusion. Besides, is Jose Pirela or Austin Romine really a better option? Greg Bird: With 11 homers in 46 games, he’s done everything expected of him and more, and now, he enters the postseason as the everyday first baseman and one of the lineup’s most important cogs. Dustin Ackley: A month ago, the thought of Ackley on a postseason roster was laughable. But since returning from injury and with Stephen Drew getting hurt, Ackley has had a chance to showcase the bat speed that once made him a top pick. He’ll likely form a lefty-righty platoon with Rob Refsnyder at second. Rob Refsnyder: See above. No one expected Refsnyder to make this list, but here he is. Yankee fans were clamoring for the young second baseman all season as Stephen Drew flirted with the Mendoza line, and Refsnyder has made the fans look wise—hitting .333 in limited action since his recall from the minors. Didi Gregorius: Once a disaster, now arguably one of the better shortstops in the AL. Didi hit .289 post the all-star break, brought down only by a sluggish September. Chase Headley: He’ll probably never live up to that contract, but as long as he’s over the bout of the yips that plagued him in the field, you could do worse at the hot corner. And, to be fair, Headley has actually hit quite well in big spots—.287 with runners in scoring position. He’ll bat in the bottom third of the lineup, but some (any) production out of him would certainly help. Brendan Ryan: Phenomenal defender, awful hitter. He joins Rico Noel on the list of guys that might as well not even bring their bat to the park. Ryan is strictly a late inning defensive sub—so long as Refsnyder’s rumored defensive issues don’t suddenly come home to roost. Brian McCann: A poor September and sluggish second half of the year in general spoiled what was looking like a potential career year for McCann. Still, he’s one of the better catchers in the league, will play every game in the playoffs, and should greatly benefit from the respite travel days provide during postseason baseball. John Ryan Murphy: As far as backup catchers go, you could do a lot worse. If Austin Romine had more than 2 at bats at the big league level this year, stronger consideration would’ve been given to carrying three catchers, but with A-Rod locked into the DH role, it’s not as if Murphy and McCann will ever be on the same lineup card anyway. Alex Rodriguez: You know him, you love (tolerate?) him, Alexander Emmanuel Rodriguez. With the entire world watching, all he did was go out and have a comeback season for the ages, and now, if the Yankees are to make a run, they’ll need to hope the 40-year-old has another good month of baseball left in him. At least a third, “emergency” catcher, meaning Austin Romine and/or Gary Sanchez will be on the roster. 7 or perhaps 8 pitchers, of which only 2 or 3 will be starters. The extra starter would likely be CC, given that by Tuesday he’ll be on normal rest. The likes of Slade Heathcott and Jose Pirela will almost certainly be included. Why? Speed. Much of the Yankees roster is old and slow, and pinch runners are always needed. Who knows, if, in some unlikely occurrence, Heathcott ends up playing a role in a wildcard victory, he could even nudge Noel off the ALDS roster.